Do you not love the word ‘toffee’? Also the word ‘ikat’. Mixed together they are quite pleasing unto my verbal senses. Also, after some googling, I discovered that ikat is the oldest known textile pattern in the world. So there’s a fun little factoid for you. Does that perhaps mean that black is, relatively speaking to the thousands of years humans have been making textiles, the new ikat? This outfit was more impressive (or high maintenance, you be the judge) with heels on, but we didn’t have a chance to snap pictures until our little bike ride to the park and clearly heels and bikes don’t mix. At least for me they don’t. If you can ride a bike in heels, I am thoroughly impressed with your grace. As you can see… grace? Not so much my forte. It’s also proof that for every marginally-okay picture I put up on this blog, the sheer number of awkward pictures we took is simply staggering. The top-middle one has to be the winner in my book as it displays my frustration in being unable to get the perfect effortlessly-chic-and-walking-across-the-street pose. So I decided to get abstract with it. Though I am equally glad that James caught me digging my necklace chains out of my cleavage as well… Clearly we should save that elegance for posterity. Your jeans look absolutely stunning! I need some like these - love it when there's an eye catcher in an outfit! haha - love that last sentence. i almost got those jeans too - but then my normal jeans and i have to buy a new pair. le sigh. 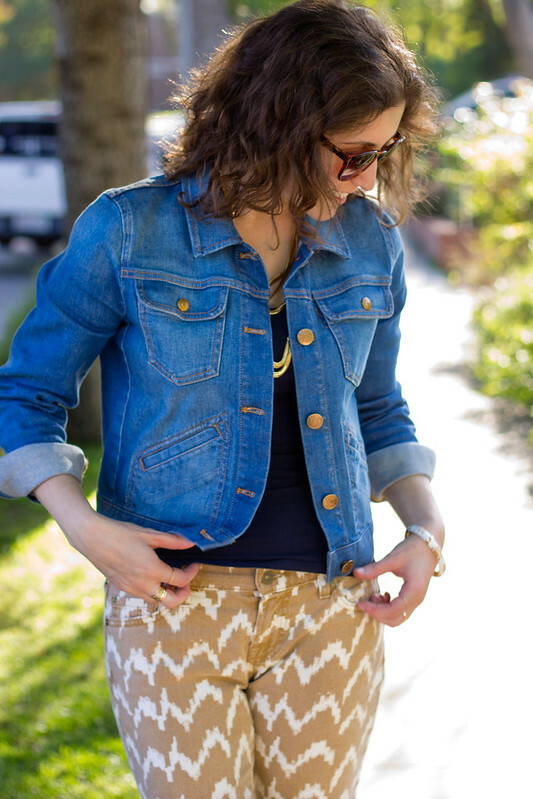 Those ikat jeans are amazing! Loving the way you styled them and put some personality into your photos at the bottoms. 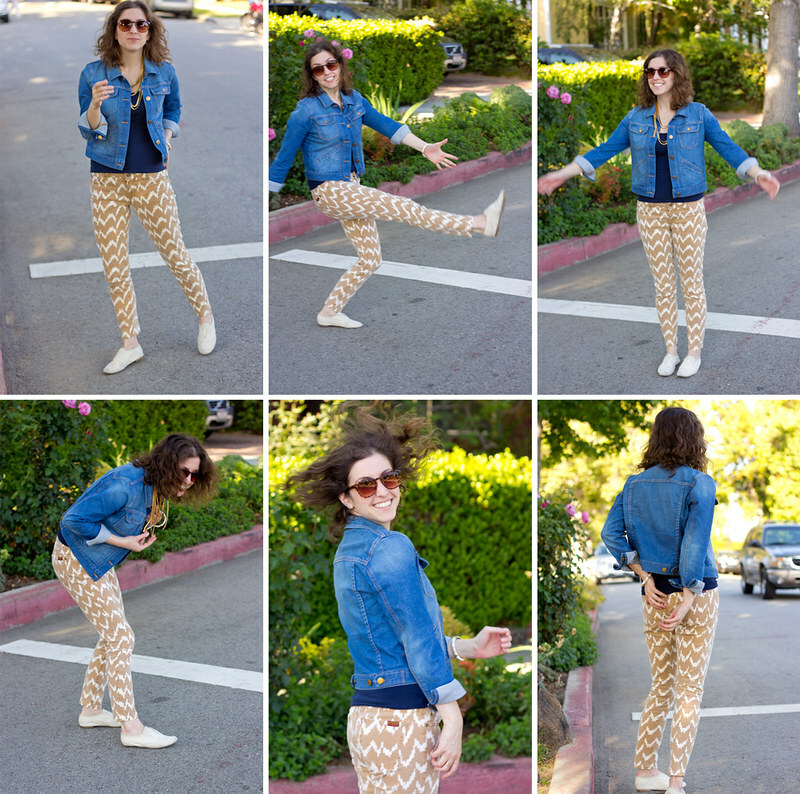 I love when style bloggers let loose instead of posing for pictures all the time! :) Cute blog girl! what fun jeans!! they look great on you!! And as for your lack of grace, you totally make up for it with whit. So you are still awesome in my book. 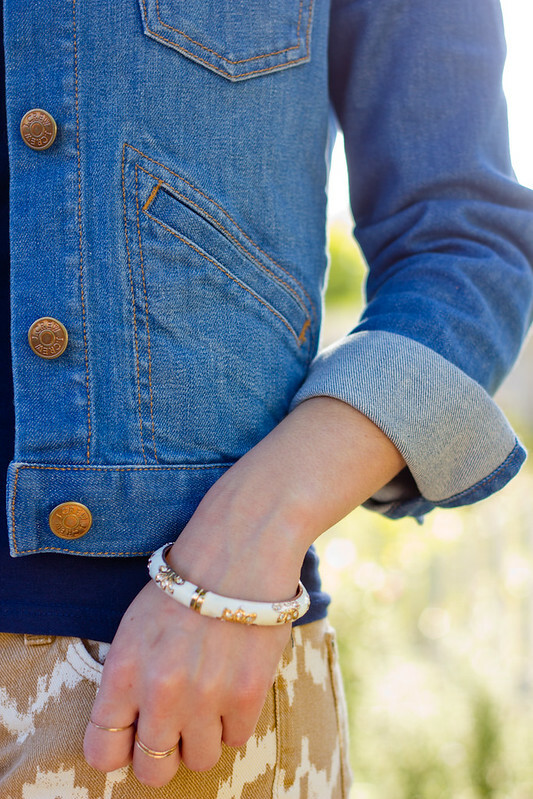 The pattern on those jeans is really fun, I like this laid back look! oooh! i love those pants! this outfit is way too cute. 'toffee ikat' pleasing not only to verbal senses but visual as well!! !love these pants!! !